First off let me introduce myself: my name is Albert and I live in Boston, MA (though I am writing this in a plane on my way to LA - so I do apologize for any spelling mistakes that might occur). I am 17 years old and is on my senior year in high school. 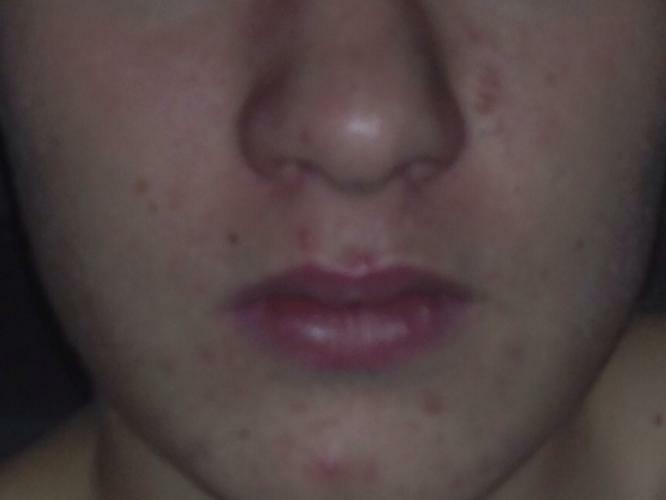 Like most other 17 year old boys, I suffer from (in my opinion) terrible acne. It is most the same type: they start out with being red inflammed pricks on my face - then some of them start to show some kind of white pus in the center). Then I do what I am not supposed to do - I pop them. Then they continue to be really red for some 1-2 months! They differ in size (though they are at max 1,5 inch across). They mainly occu on my chin, on the area between the upper lip and nose and on my jar (both the left and right side). I have unsucessfully tried BP (2,5%, 5% and 10%), the Dermatological Acne 3-step cure and the Salcura Anti-Acne Spray. I am super desperate - and hope someone out there can help! P.S. I posted an image to show my point. What's your diet like? Cleaning up my diet got rid of all my inflamed acne. McDonalds (yeah, I know) combined with somewhat heavy drinking (some 1,5 cup of vodka) - perhaps 3-5 times/month. Sorry for the late reply. I was busy with Christmas stuff. If I were you I would try an elimination diet. Or maybe try cutting out the McDonalds, eggs, bread, and vodka for more than a month if possible. Also make sure all your meals are low glycemic load. I would also try using a sls free toothpaste since the majority of your acne is around your mouth. You could also run your cleanser and other face products through cosdna to see if anything in them could be clogging you.